Although he knows the tweet has given him an international platform, which means he's invited to global events like this several times per month and has to turn most of them down, Peduto wants to be known for more than just one tweet. He would like to be remembered for all of his environmental work as a mayor and city councilor, including sponsoring the city’s first climate action plan nearly a decade ago. 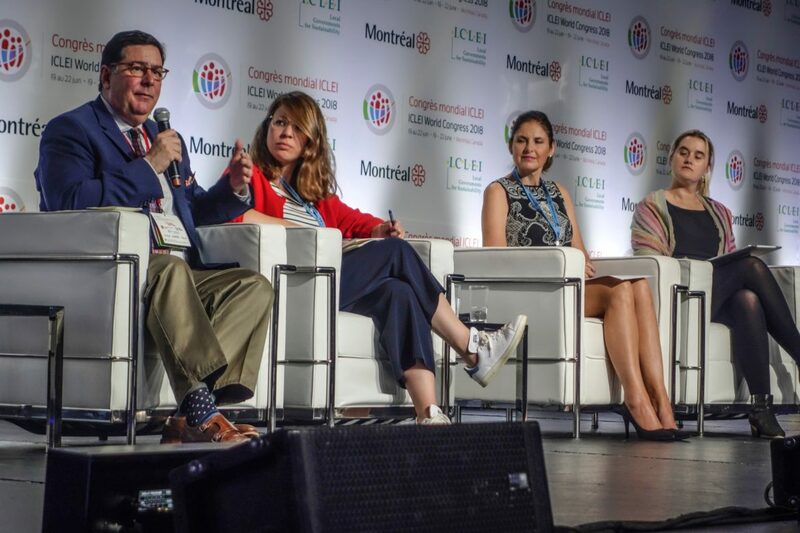 But a year after this initial enthusiasm, the ICLEI conference was an opportunity to judge whether this increased responsibility and attention was justified by what cities have been able to do or could realistically accomplish. 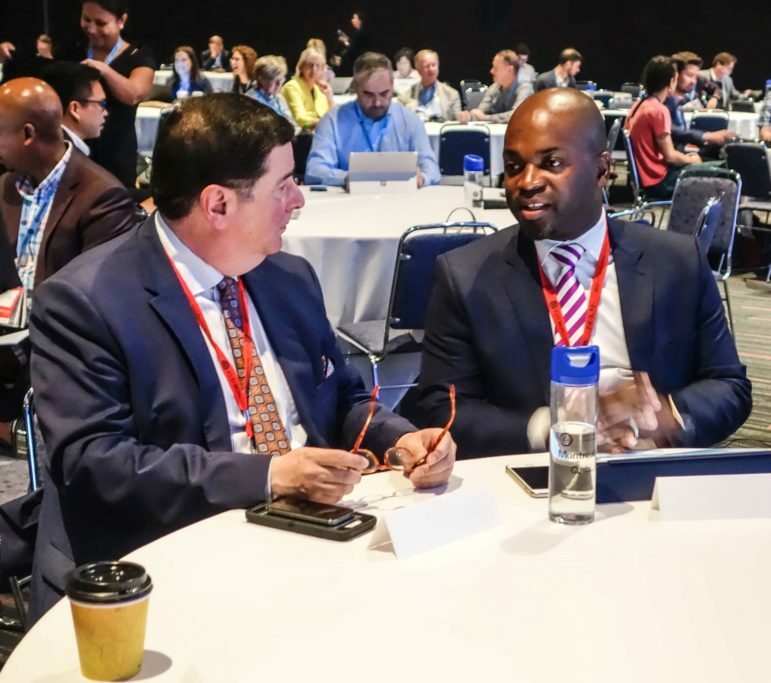 More than 1,200 attended from cities across the globe, including some mayors like Peduto, to share what was working and to seek new ideas. Toward the end of the meeting with Sridharan, Peduto said he had one more issue he wanted to bring up. “A lot of the people who voted for Donald Trump didn’t live in the city of Pittsburgh, but they lived all around it,” Peduto told Sridharan. The Democrats had offered these rural voters coding jobs, which they took to be an insult, and Trump had offered to bring their mining jobs back, which wasn’t realistic, he said. What Peduto wanted to know was how he and the Bonn mayor might be able to work together to bring renewable jobs to these former industrial areas surrounding Pittsburgh or similar areas in Germany, like Essen or Dortmund. “How can we make the investment and sell that idea?” Peduto asked. The issue of rural jobs is important to the Pittsburgh region’s efforts to reduce its greenhouse gas emissions. Shell is building an ethane cracker plant that will bring about 600 jobs once it is complete and emit about two million tons of greenhouse gases per year. That’s the same amount of greenhouse gases Pittsburgh hopes to stop emitting, if everything goes perfectly, by 2050. And there are plans to potentially bring even more industry and cracker plants to the region. If politicians like Peduto don't have an answer for what kind of climate-friendly jobs they can bring to the region in place of petrochemical ones, the Pittsburgh region may continue to see additional fossil fuel jobs and see its climate emissions increase. But Essen and Dortmund don’t have the same economic challenges as rural Western Pennsylvania, Sridharan said. “Essen and Dortmund are not the problem,” he said. “The problem is brown coal.” Even as Germany has adopted some of the highest levels of renewable energy in the world, it also continues to rely heavily on brown coal, or lignite, the lowest quality of coal. This interaction was typical at the ICLEI conference: In an attempt to learn from each other, cities often found surprising similarities but also substantial differences. 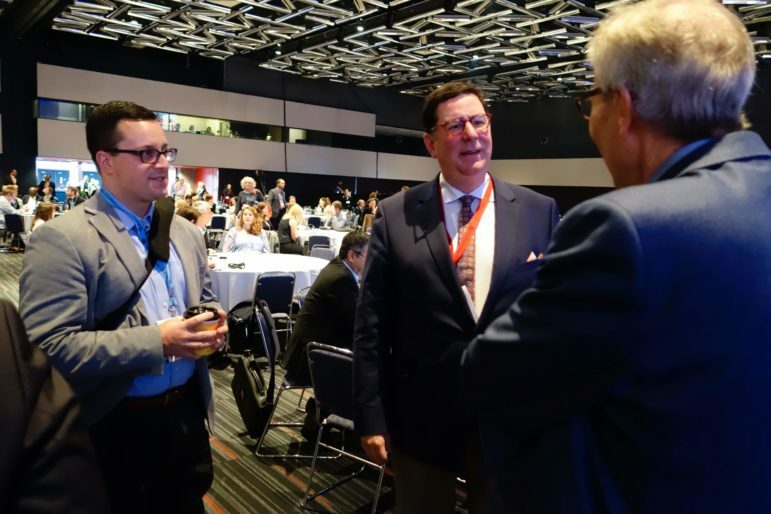 Instead of the meeting leading to new ideas or a commitment to pursuing rural green jobs, Peduto accepted an invitation to another climate change conference in Poland in December. The work would continue. If cities like Pittsburgh are going to take more leadership on climate change, they still have to invent the means to do so. Grant Ervin, the city’s chief resilience officer, managed to talk to the mayor about only one of five upcoming sustainability projects he wanted to discuss while there. and an application to the Bloomberg Climate Challenge Grant. For example, New York state has invested money in solar manufacturing in Buffalo. At the same time, Pennsylvania has granted similar tax incentives to fossil fuel companies, Ervin said. Though Peduto opposes additional petrochemical plants in principle, he supports the political institutions and processes by which they are likely to be approved. Pittsburgh appears helpless against the other big regional threat to its climate emissions: the proposed closure of the Beaver County nuclear power plant in three years. The plant supplies 70 percent of Pittsburgh's electricity. If the plant closes in a few years and is replaced by natural gas, or even dirtier coal, the city’s climate emissions would increase dramatically. But whether the federal government steps in to save the nuclear plant is hard to predict, Peduto said. So Pittsburgh is taking a couple of steps that are within its control: it’s helping to set up six district energy microgrids, Peduto said. This energy is produced locally in small neighborhoods of the city and won’t be subject to whatever mix of energy the rest of the city imports from nearby power plants. At first, some of that district energy will be natural gas, but Ervin said the hope is that it will eventually be renewable. The city is trying to figure out how to get to 100 percent renewable energy by 2035. Its most recent step is to try to pool its resources with other nearby cities to see if it can spur investment in local renewable energy, but the details of how this will work in practice are still a year away, Peduto said. Cincinnati shares many of the same challenges as Pittsburgh: an industrial past, a steep population decline and a similar topography along the river. And both cities are pushing now to find out how to procure 100 percent renewable energy in their cities. Cincinnati has been able to buy green power wholesale for its citizens and sell it at a 10 percent markdown, according to Oliver Kroner, the city’s sustainability coordinator. The city has signed up 80,000 people to the effort, he said, which has cut 250,000 tons of carbon dioxide and saves each resident who signs up 10 percent of the retail cost. Now the city is planning to build a 25-megawatt solar farm on 140 acres, which Kroner said would be the largest city-owned solar farm in the country. While Pittsburgh’s carbon emissions increased by about 10 percent, between 2003 and 2013, during a similar time period, Cincinnati’s went down by about 18 percent. Cincinnati’s electricity has traditionally been powered by lots of coal. So as some of the dirtiest coal was replaced by cleaner natural gas power plants, Kroner said, the city saw large reductions in its emissions. During the same time, Cincinnati’s vehicle emissions increased. Although Boulder, Colorado is smaller than Pittsburgh, it’s been able to punch above its weight class because of its prosperity and liberal voters, according to Matthew Applebaum, the former mayor and city councilor, who serves on the ICLEI USA board. "Communities that have a supportive population, communities that have some resources, communities that are growing, those are exactly the cities that you count on to try new things,” Applebaum said. Like Pittsburgh, most of Boulder’s greenhouse gas emissions come from the energy used in its buildings. That’s because their energy comes from a local coal monopoly. The city has been trying for years to take over the energy supplier in its city, so it can buy renewable energy instead, he said. But the effort has been locked up in the courts, with no end in sight. The city has had better luck trying to improve the efficiency of its buildings. About six years ago, the city mandated that all the landlords in town would have to make improvement in their buildings until the buildings met a basic threshold for energy efficiency. Recently, there has been some pushback, he said, because landlords are saying they have to increase their rents to pay for the improvements. But even if the rent does go up a little bit, he said, the tenants, many of whom are the most vulnerable members of the community, should see an even bigger savings in their electric bills. “As far as I know it's the only ordinance in the United States like this,” he said. Essen is a former coal and steel town that has had to recently spend a lot of money to clean up problems of its past. “We worked really hard in the last decades on transforming the old brownfields into green spaces,” said Sebastian Schlecht, who is the project manager for Essen's European Green Capital program. And just like Pittsburgh, Essen (the largest city in a region of 52 cities) struggles to coordinate its environmental policy with surroundings towns and boroughs. This region of 5 million people has a political body for all the mayors to get together but their decisions aren’t binding. So the region is developing a "bicycle highway," but Schlecht said they don’t know exactly when the highway will be finished because it depends on when all of the different mayors get around to doing it. Malmo, Sweden has about the same number of residents as Pittsburgh and a similar history. Malmo used to build the biggest oil tankers in the world in the 1970s. But, in the 1980s, the industry collapsed, about a quarter of the population left and unemployment soared. And just like Pittsburgh, the city was left with brownfields that had to be cleaned up. “We have gone through a radical transformation from being that industrial city to having our first university now, for about 15 years, with about 25,000 students,” said Ola Nord, the head of Malmo’s European Union office in Brussels. I love what Mayor Peduto is doing for the city but I wish he would put pressure on County Executive, Rich Fitzgerald, to change the future of Beaver County and the region. Instead of Dutch Shell building a petrochemical plant, build a solar farm and green industrial Park. This will bring in far greater than the anticipated 600 permanent jobs which Shell has projected. A solar farm and green industrial park will bring in more than 6,000 jobs and growing. The 6.5 billion tax credits would be far better served and we would usher in a green future rather than business as usual, polluting air, water and the fate of our earth’s future and with it mankind.